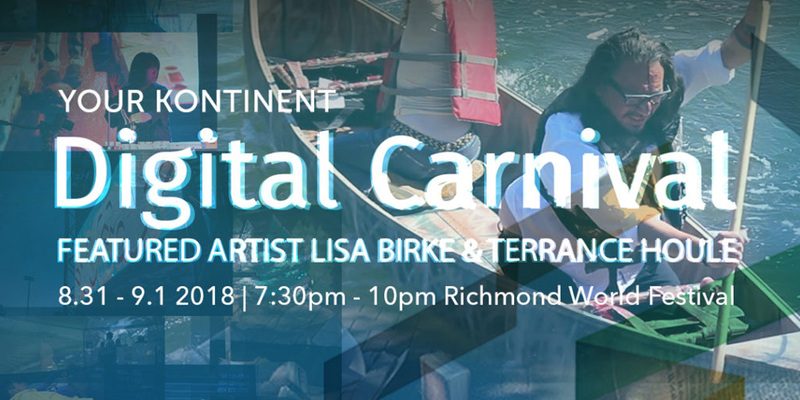 CASV members are invited to attend Digital Carnival, presented by Cinevolution Media Arts Society in partnership with Richmond Art Gallery. Different Ways is a collaborative project between Terrance Houle, an interdisciplinary artist and member of the Kainai Nation (Blood Tribe) and Lisa Birke, settler, video artist, and Assistant Professor of Digital and Extended Media at the University of Saskatchewan. This project takes to heart the call to action for all Canadians to begin a conversation—to listen and to learn—in a bid for reconciliation. Through ceremony, music, live performance, animation and innovative projection, the slippery and unsteady understanding of our shared history and stories will be explored at events and festivals across the country, demonstrating how dialogue and reclamation can steady the course in Indigenous and non-Indigenous relations. A live performance will be combined with projection in a montage of video clips, underwater footage, 360-degree video and live-capture animation created in community outreach workshops remixed into an expansive experience. The artistic and poetic vision is one that will allow the viewer to imagine a better future; a future of coming together despite, and more importantly because of our “different ways”. Burke and Houle’s journey began at Flotilla 2017 at Confederation Landing Park in Charlottetown, Prince Edward Island. Now coming to the west coast, this iteration of Different Ways will incorporate footage collected from Houle’s traditional family territory outside of Calgary, Alberta on the Bow, Ghost and Sheep Rivers. Also included will be documentation of their performance at Confederation Landing, and stories and imagery contributed by members of the Indigenous community. At once playful and profound, Different Ways opens the space for questioning and conversation around the complex relationship between Indigenous communities and settlers on this land. The Featured Artist Exhibition is presented by Cinevolution Media Arts Society and Guest Curator Wynne Palmer as a part of Digital Carnival 2018: AIR. For a full list of participating artists, visit http://cinevolutionmedia.com/portfolio-item/dc2018-air/.